C1505. GEORGE SZELL Cond. 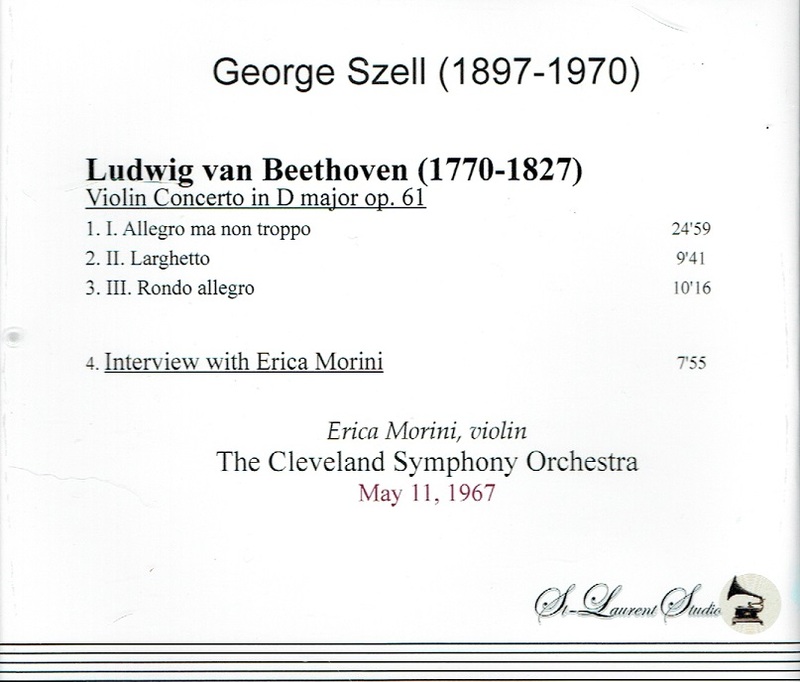 Cleveland Orch., w.ERICA MORINI: Violin Concerto in D (Beethoven), Live Performance, 11 May, 1967, Severance Hall; Interview with Erica Morini. (Canada) St Laurent Studio YSL T-414. Transfers by Yves St Laurent. "Erica Morini (1905-1995), born and trained in Vienna, managed, as one of the first female violinists of the first half of the 20th-century, to build an international career. This was unusual at a time when the concert platforms were still dominated by male soloists. Morini started out as a child prodigy; following sensational debuts with the Gewandhaus Orchestra Leipzig and the Berlin Philharmonic under Arthur Nikisch, she performed at Carnegie Hall in New York for the first time in 1921. Morini, who was of Jewish descent, emigrated to the US in the late 1930s, extending her career in that country. Her artistic career lasted for over five decades; however, she made few commercial recordings. 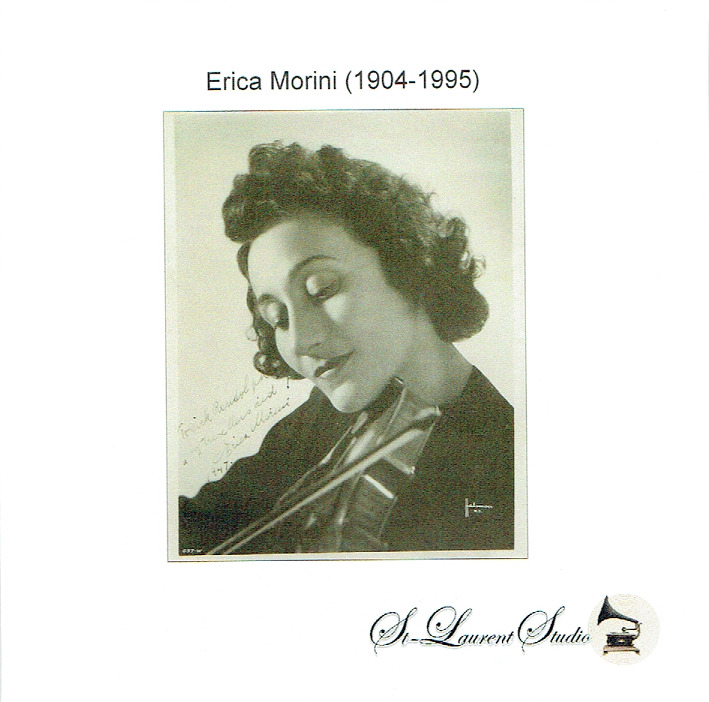 Admired by colleagues and audiences alike, Erica Morini rose to an eminence far beyond that of a mere violinist's violinist or token woman in a man's world." "Part of the wave of great Hungarian conductors who took over American musical life just before and after World War II - the others included Fritz Reiner, Antal Dorati, and Eugene Ormandy - George Szell quickly transformed a middling Midwestern orchestra into one of the nation's 'Big Five'. His cultivation of the Cleveland Orchestra set an example of discipline and hard work that gradually helped raise the standards of orchestras across America. Szell began focusing more on orchestral repertory in the 1930s; he made his U.S. debut as guest conductor of the St. Louis Symphony in 1930, and in 1937 he was appointed conductor of the Scottish Orchestra in Glasgow, while maintaining a steady relationship with the Residentie Orkest in The Hague. Szell was in America in 1939 when war broke out in Europe; he remained in the U.S. through the war, first depending on guest engagements and then, in 1942, becoming a regular conductor at the Metropolitan Opera, where he was especially praised for his Wagner performances. In 1946 Szell took American citizenship and became music director of the Cleveland Orchestra, a post he held for 24 years. He was also the New York Philharmonic's music advisor and senior guest conductor during the last two years of his life. 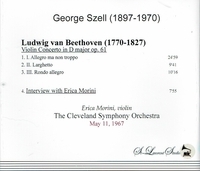 Although Szell made recordings in Europe in the 1950s and 1960s for Decca, and in Cleveland at the end of his life for EMI, the bulk of his substantial discography was the result of his long collaboration with Columbia Records in Cleveland. There, Szell had inherited an able but ordinary orchestra and, through sheer determination, molded it into one of America's finest. A Szell performance was remarkable for its textural clarity, chamber-like balances, and precision of attack and release. He drilled his orchestra mercilessly, even in works it had performed with him not long before. Szell was particularly admired for his performances of Austro-Germanic classics from Haydn to Richard Strauss, his sharp renderings of works by a select group of twentieth century composers including Bartok, Prokofiev, Janacek, and Walton, and his idiomatic way with Dvorak. Indeed, some collectors maintain that Szell's monaural, early 1950s recording of Dvorak's Eighth Symphony with the Concertgebouw Orchestra has never been equaled. His treatment of French composers, on the other hand, was criticized for its lack of atmosphere, and detractors maintained that he achieved precision at the expense of emotional expression. To those who demanded a warmer approach to his beloved Mozart, however, Szell is said to have retorted: 'One does not pour chocolate sauce over asparagus'."